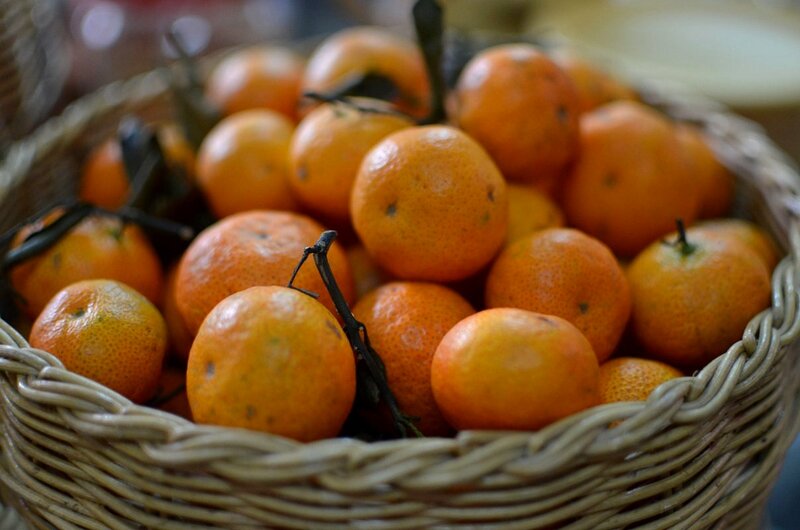 And so the best part of CNY is over as everybody goes back to their routine today. My daughter left for Shanghai this morning and my youngest left at noon for NS camp. I'm not feeling so bad, even though the vacumn is there in my heart, because Middle Child is here for another two weeks. This CNY seemed more subdued to me than previous years, probably because of the burglaries in my neighborhood and the awful incident where a guy died while checking on the fireworks he had lit and another case where a young man crashed his car into a signpost on the road outside our taman. We just feel so bad for their families each time we hear fireworks. The fact that such commercial public-type of fireworks are so easily available despite the ban just shows how out of control everything is. I strongly feel that we should report neighbors who set off those big fireworks. It's both dangerous and annoying to the public, especially in housing areas and at wee hours. We had our reunion dinner in a hotel for the first time and not at MIL's because we had relatives from Shanghai and MIL couldn't cope, so I didn't bother to take photos of the food. No unicorn or lion dance troupes came to the house until the 3rd day and I was so happy when they came that I let them into my garden where they rolled and pranced around like little lions. It was a big difference to previous years where I had to sometimes pretend that no one was home because too many troupes came visiting. 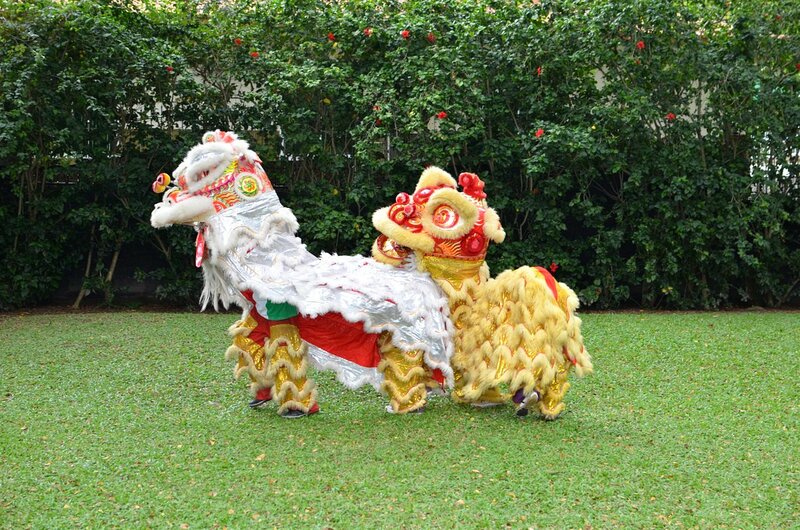 I think that the tradition of lion and unicorn dance troupes coming to the house is dying out as it is more lucrative and less tiring to perform at special events than to go house to house. Likewise, when I was a kid, bai nien was families taking turns to visit each other, with the younger families visiting the older ones first but now bai nien means big dinners where so many people are gathered that nobody really gets to catch up with the hosts. I must clarify that I DO love CNY music, but only the traditional ones from the 60s, not the West Malaysian ching chang chong stuff that we get now. There's nothing I love better than cranking up the radio (yes, radio) to CNY music the first thing in the morning of the first day of CNY.It's a tradition that my dad practised, and it meant that we had to be up early, dressed in new clothes to wish our parents "Gong xi fa cai" (happy properous new year) before the visitors arrive. I have always wanted my kids to wake up early on CNY, come to Hub and I as we are seated happily, and bow with clasped hands the traditional way and wish us "Gong xi fa cai" as we smilingly hand them their ang paos (lucky money). But that never happens, especially as they got older, as my kids don't come down until past 10 am despite all my hollering. Usually by the time they get to the table, I'm so busy and upset that I don't give them their lucky money until days later. Oh, we have been getting exciting news recently. My daughter Hong Yi had posted a video of herself using a basketball to paint the basketball giant (oops) Yao Ming about 3 weeks ago and Gizmodo, a bigtime American website that features new ideas in technology and science, had posted Yi's video on its website on 25th Jan. Gizmodo, btw, had its 15 minutes (and more) of infamity in 2010 as it came into possession of the iPhone 4 prototype that was left unattended at a bar in California. The video quickly became viral, spreading to other online sites such as ABC, CBC, NBC, Hufftington Post and Yahoo! ESPN and NBA also posted the vid and the Good Morning America people wrote to her too for permission to air the vid on the show. People from as far as Sweden and Serbia wrote in to say they saw the video on their TV. The vid continued to spread to England, where my niece had the funny experience of friends showing her the vid on mobile phone and looking at her in disbelief when she said that the girl in the vid was her cousin. Yesterday, the Taiwanese newspapers picked up the news, followed by the West Malaysian Chinese papers who gave her front page coverage. Today, the Phoenix Channel in Hong Kong posted the vid and we've been told that the news have finally arrived in Shanghai too. You can go to all the links by typing "Girl painting Yao Ming with basketball" on Google. 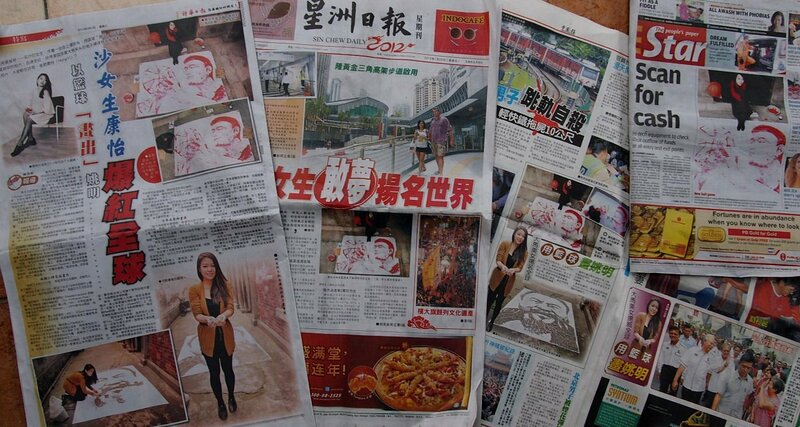 See Hwa Daily News: "Sabah Girl Hong Yi Famous Around The World", Sin Chew Daily: "Malaysian Girl Dares To Dream", China Press: "Beauty Uses Basketball To Draw Yao Ming" and The Star: "The Basketball Is In Her Court". Yi--who goes by her arty nickname Red because in China 'Hong' is red--has always loved to draw, especially cartoons, and even when she was studying architecture, her secret ambition was to work for Pixar. Now's she's happily working in the Shanghai branch of Australia's largest archi firm and she draws when she has the inspiration and time. We are proud of her but the deluge of phone interviews and attention is worrying too. That's it, I should stop the shameless pitching. Back to regular food blogging tomorrow. hehe. and not to mention, she can really draw. it's not an easy thing - trying to replicate something small into something big, with a basketball! and that guy from your taman who died checking the fireworks... he was being talked about today at the place where i got my hair rebonded just now! small world! michelle: thanks:) am sure she's feeling 10 feet tall now. Terri, I agree with you on this. We really have to put an end to the smuggling and import of fireworks before more lives are lost or risked. I understand the importance of it for CNY, but what's the point of having it banned when it's readily available during festive seasons? Do you mean the dong chiang? Yeah, the CNY songs that they play here can be annoying to the ear. Anyway, congrats to your daughter! I'm so glad for Yi and you!! I imagine how proud of her you are!! Your daughter is so pretty and awesome. She is so artistic and talented. You must be so proud of her. Beauty with talent. Awesome. I do hope your daughter will be able to work for Pixar one day. I see from their website that they have a position for a "Story Artist" in Emeryville, CA (link below). Hong Yi is such a talented and positive person (from her blog) that it is no surprise good things come her way. Perhaps she could create a short animation about a uniquely funny experience in Shanghai and send to them. You never know where it may lead :) Just like the Yao Ming painting! You must be proud of her. She is talented like her mom. Happy for you both. She will go far and hope her dream will come true. hi Terri! I was completely blown away by the video of her and the artwork she had done. I couldn't even hope to do it with a proper pencil and paper. It's a talent that she must pursue and I'm sure she will go far with it. Am sure you feel so proud of her. I do! waverley: why is it tt sg can enforce the firecrackers n fireworks ban but we can't? i'm not buying the excuse 'their population is small'. we can't even control the fireworks ban in kk where the population is under 1 million. i am ok with firecrackers, esp if there's a time curfew n if the crackers are not abnormally load. but fireworks shd be banned bc they fly everywhere. running brook: thank u, am really happy to have so many positive comments:) she's a great girl. runningbrook: your kids are still young and if i may, i suggest tt you keep a acrapbook of all their drawings n writing n other little notes n stuff. i wish i didn't throw so much of my kids stuff away. it's fun to look at them when they are older. n they appreciate going thru all their scraps. runningbrook: thanx for the news! we don't get the star here until afternoon n i just saw your msg n then another one on yi's facebook:D she's also on a sarawak newspaper, see hwa, full page on pg 18! her dad's so proud of her, he told the ppl buying the papers "tt's my daughter" they said "pretty girl" and "is she getting married?"! Well done Hong Yi... and kudos to you Terri for doing such a great job bringing up such an amazing young lady. I'm sure you are her inspiration and vice versa. For me - both of you are amazing and truly an inspiration to us all. she is such great talent! indeed an inspiration to all. She's done us all so proud - and I can only imagine how proud and happy Uncle Wedge and you must feel to know that you brought up such a wonderful girl, who's talent is as great as her heart is. My jaw just dropped when I saw a photo of Hong Yi on Daily Mail. I pretty much screamed to hubby - Terri's daughter is on the news! (not that he knows who all these fellow bloggers I'm "chatting" to). You must be a proud mama. What a beautiful and talented young lady. when i saw the front page of Sin Chew daily newspaper that featured your daughter, I proudly to show to my husband, and told him that this is my blogger friend's daughter, hahaha..I'm proud for you to have a talented daughter..
That's really creative. Congrats to Hong Yi aka Red! Gong Xi Fa Cai to you Terri! Fireworks ban? What fireworks ban?We're still hearing fireworks being shot off in our neighborhood nightly. Chap Goh Meh is going to sound like a warzone in Kuching. Congrats Terri, your daughter is awesome. I do read her blog occasionally as well, her works on Ai Wei Wei is also great. Amazing talent she has, I would be so very proud too if I had a girl like her! Pixar could still happen, my ex's brother is now working for Dreamworks in LA, it was a dream come true for him. Meanwhile I'm glad Singapore has banned fireworks for donkey years, I was quite worried when I first came to Shanghai and experienced them and can only hope that my neighbours would be reasonable (our houses are made of wood!) about them. So far so good. Good Luck in pursuing your art career, Yi! Congrats to your daughter, Terri. You & your husband must be very proud of her. Can't wait for her next video! Terri, saw her you tube video sometime back, then your post and then today saw the news on the internet newspaper! Wow, Hong Yi is going places! hehe. It is awesome work! I think Yi will be a very famous artist one day. She has this potential! I'm so proud of "knowing" you and Yi. So I posted Yi's video on facebook and my friends were blown away by Yi's talent! I received a message from Daisy that you and your daughter are coming to Monterey California. And she is going to be a speaker at the EG Conference. That is amazing!! Now that I am able to go through some of your blogs--- no wonder. She is very very creative and talented. I am not far from Monterey, and if you have time in your schedule- I'd be delighted to meet up, and show you around the San Francisco Bay area. Did Daisy mention that my sons work at Facebook? They have a few friends who work at Pixar- perhaps can make an appointment to visit? Email me at YiengChailu@msn.com (I am on Facebook under that email)or call (408)391-5675. Best regards to your mom and family. Have not forgotten your wonderful hospitality when we were in Sababh Dec 2007 !! How time flies.